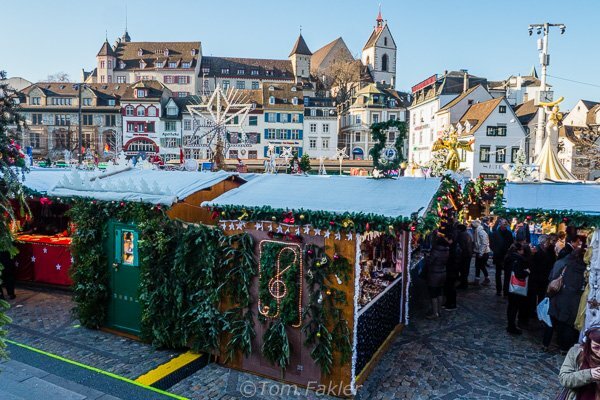 The Christmas market at Barfüsserplatz and Münsterplatz in Basel is one of the prettiest and largest in Switzerland. 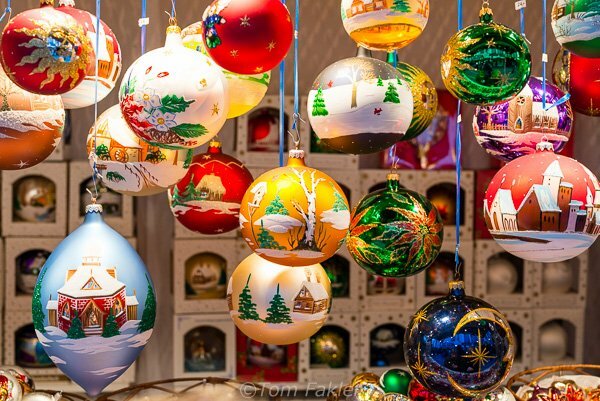 Many Christmas markets were originally set up at the base of grand cathedrals of Europe. 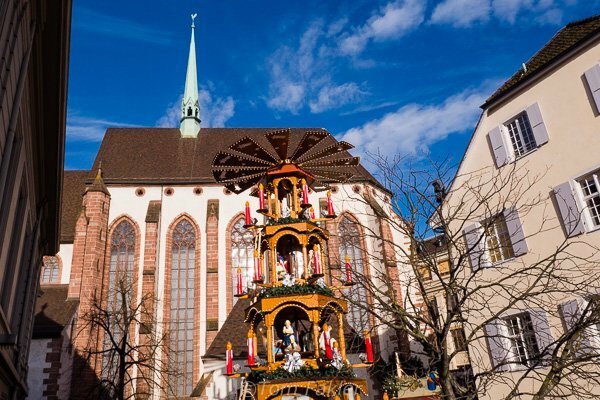 In Basel, two churches share the honors: the Münster, the town’s former cathedral, and Barfüsserkirche, a church named after its original founders, the barefoot Franciscans. New this year, an impressive Christmas pyramid in the passageway beside the church. At “Barfi”, as the locals call the square, vendors of handmade goods vie for attention with Glühwein stands and a tiny ferris wheel for children. 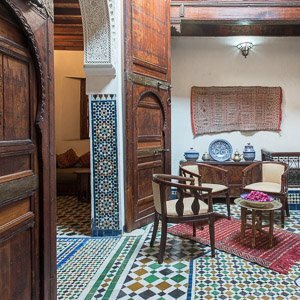 Everything is set against a backdrop of the Barfüsserkirche and across the square, the hilltop Lohnhof, a convent-turned-prison-turned fine hotel and apartment building. 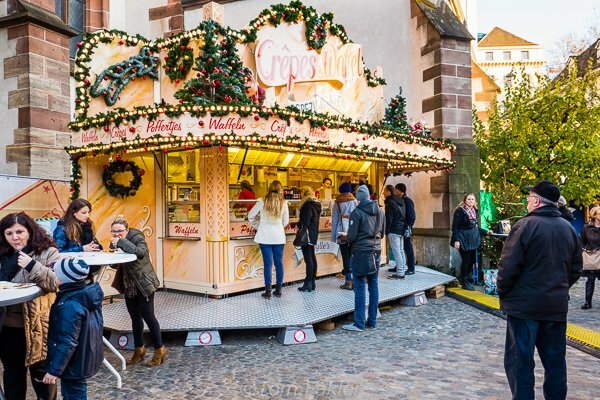 Traditional displays include a hat maker, stands selling Bratwurst, fruit bread, candies, and potato puffs with salmon or apple compote sides. One of my favorite stops is the crepe and waffle stand just beside the church. The Christmas market at Barfüsserkirche, beneath the Lohnhof, a convent-turned-prison-turned fine hotel and apartment building. 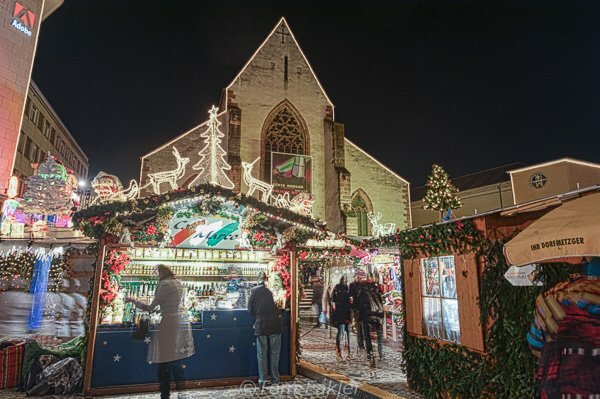 The Basel Christmas market at Barfüsserplatz, a square fronting Barfüsserkirche, named after its original founders, the barefoot Franciscans. 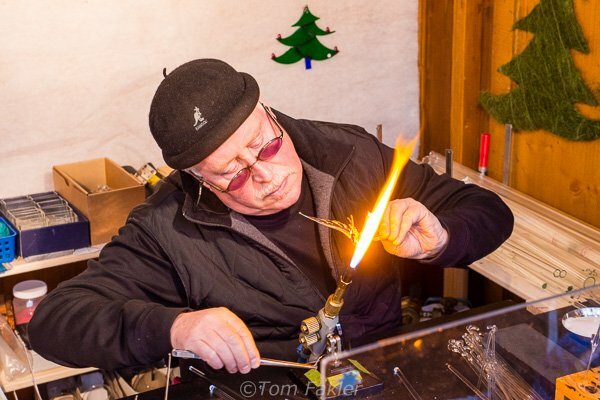 The glass-maker’s art is just one of the demonstrations for visitors to the Basel Christmas market. Glass ornaments are decorated with winter scenes from country and town, each one a perfect gift for someone. 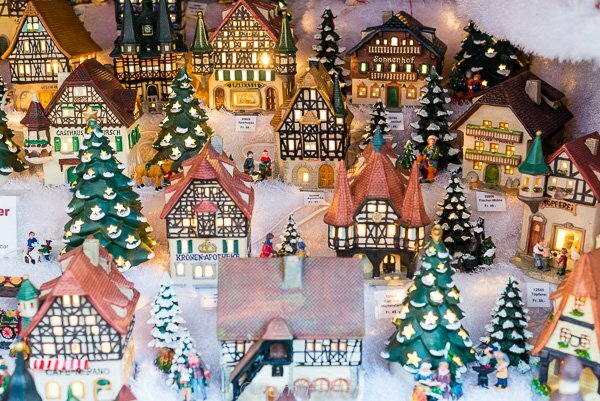 Miniature half-timbered houses, drugstores, churches and train stations make up medieval towns, each building and decorated tree, a lovely gift item. Anise cookies and marzipan, ready to stuff a stocking or two. 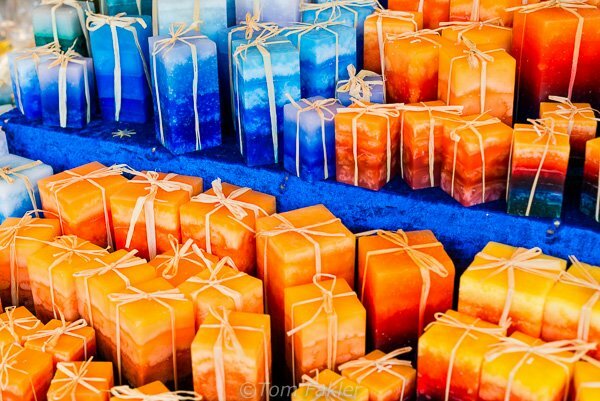 You cannot have too many candles, and at the Christmas market, they come in every color combination imaginable. 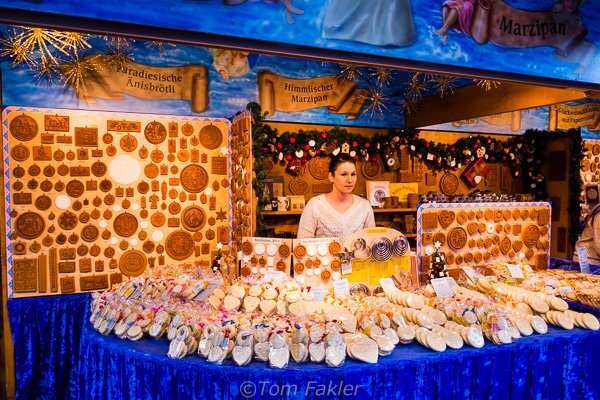 Crepes, waffles and more waft a fragrant sweetness over this corner of the Christmas market. Tasty snacks are everywhere at the Christmas market, to be enjoyed at one of the handy Christmas tree tables near the church. 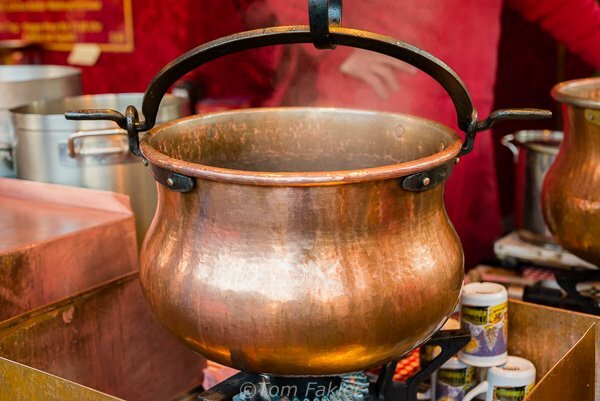 Glühwein is a cold-weather staple at markets across Europe. 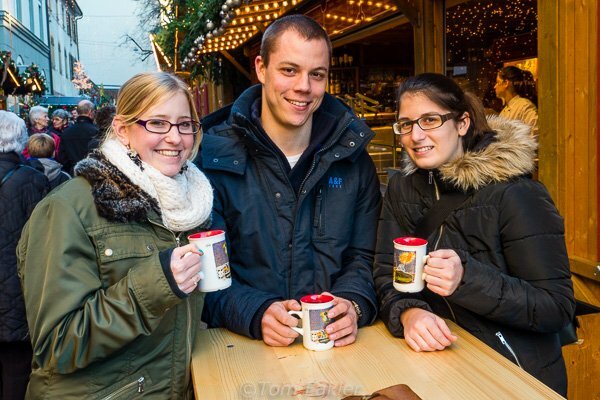 At the Basel market, there are several opportunities to enjoy a mug of mulled wine with friends. 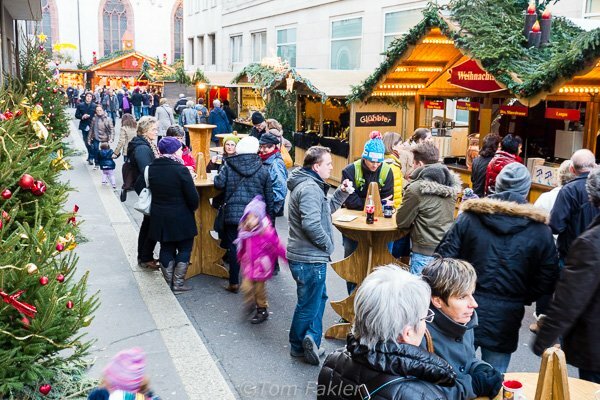 At the Basel market, there are several opportunities to enjoy a mug of mulled wine with friends. Barfüsserplatz is a hive of activity year-round. A twice-monthly flea market, concerts, even sporting events draw crowds of locals and visitors. The church houses the primary location of the wonderful Basel Historical Museum, well worth a look-see. Don’t know Basel? Head around the corner to the tourist information office in Stadt-Casino. The helpful staff there offer brochures and visitor advice, as well as Basel-themed mementos. 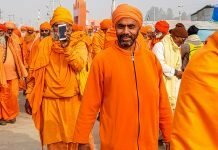 Thank you for your magnificent blog. 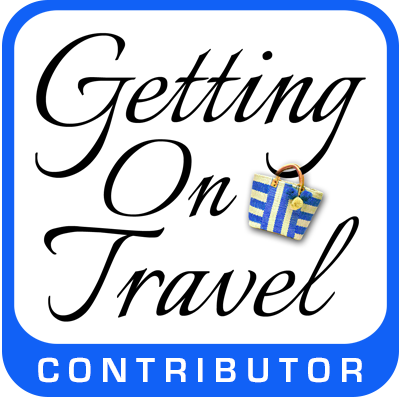 I enjoy traveling the world with you, experiencing new places, people, customs, that I am able to see through your eyes by your vivid descriptions and superb photos. Thanks so much for having me on your list; I look forward to each one. Thanks Doris for your kind words! 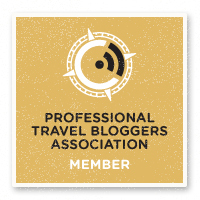 We are so happy that you enjoy the blog, and I am delighted that you wrote to tell me. Wishing you all the best for the season and in the new year! 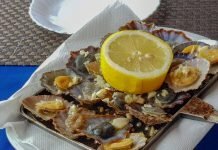 Now you have my mouth watering again, especially for those potato puffs with salmon or apple compote on the side (have not seen them in previous trips)! Gorgeous photos. This is truly a special market, and you are so right that the architectural backdrop makes it even more enchanting. Thanks for posting! The food on a chilly day is just about the best part for me…my potato puff indulgence comes with salmon and horseradish, but then there are those Nutella crepes, and the little quiches, and bags of perfect cookies to take home. Ahhh.